The Government of Canada is considering changes to its counter-proliferation framework, and is asking key Canadian stakeholders in academia, the scientific community, and industry to become active partners in developing options to update it. This Discussion Paper provides information on the current framework and the challenges it faces. You are invited to read this Discussion Paper and respond to the questions it raises; your responses will constitute input into the development of potential new laws, regulations, and policies to improve our approach to counter-proliferation. A hypothetical scenario that appears harmless and well intentioned will also be introduced in the following pages as food for thought, which you are invited to consider as you read through. You are welcome to provide additional feedback, outside of what has been raised within the Discussion Paper. You can submit your comments using the following email address: ps.nspdcptf-dpsncpfat.sp@canada.ca. The national security landscape in Canada today is more diverse and complex than it has ever been. From terrorism and organized crime, to foreign interference and espionage, the security challenges Canada faces are immense, and proliferation is no different. This exercise forms part of the Government of Canada’s efforts on national security to address these diverse challenges and to help protect the safety and security of Canadians: the introduction of Bill C-59Footnote1, the ongoing review of the Anti-Money Laundering and Anti-Terrorist Financing Regime, and the release of the National Cyber Security Strategy, are but a few of these ongoing efforts. At the same time, the Government of Canada has committed to being more open and transparent with Canadians about national security: this dialogue is conceived in that context. Counter-proliferation generally refers to the principle of preventing the spread of weapons of mass destruction (WMD) as well as the items and materials that can aid in their development. 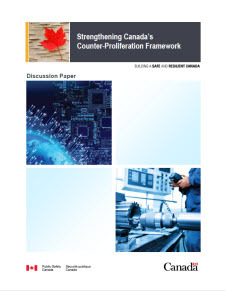 In this Discussion Paper, we define “counter-proliferation” as: The efforts undertaken by the Government of Canada to detect, investigate, prevent, deter and disrupt activities and transactions in or through Canada involving the illicit acquisition, export or diversion of goods, technology or knowledge relevant to the development of chemical, biological, radiological and nuclear weapons (“weapons of mass destruction”, or WMD), their delivery systems, dual-use items of concern, and sensitive defence technologies, including space technology, which could constitute a threat to Canada and its allies. This includes the transfer of technology via intangible means (e.g. electronic, voice, etc.). Today, proliferation is evolving in ways we have never seen before. People, goods, and money flow quickly and easily around the globe thanks to modern transportation, trade, financial networks, and the Internet. Technology is rapidly advancing in areas such as encryption and cryptocurrency, which can be used to hide illicit activities from authorities. As well, many goods and technologies – including those not specifically intended for offensive applications– have the potential to be used or modified to produce weapons and military items. These items are called “dual-use items of proliferation concern,” and their illicit acquisition and potential misuse are an important concern to the Government of Canada. Why should I be concerned about proliferation? Canadian businesses and research institutions are recognized as leaders in many high technology sectors, such as nuclear energy, biotechnology/life-sciences, aerospace, chemicals, and electronics. Canada’s post-secondary education system is also among the world’s best, offering advanced degrees and groundbreaking research in the sciences and engineering. All of these factors make Canada – and you – potential targets for would-be proliferators. Many states and non-state actors such as terrorist groups aspire to develop WMD or to acquire controlled/non-controlled items. These items, because of their specifications or capabilities, are of proliferation concern as they could help advance their own military capabilities, thus putting Canada and its allies at future risk. Multiple state and non-state actors have become highly adept at using clandestine procurement networks and innovative methods to circumvent the national and international counter-proliferation framework designed to stop them. Canada’s international business, research, and security relationships depend on Canada being seen as a trusted and responsible partner that works to control the proliferation of weapons, dual-use items of proliferation concern and related technology in a manner that is consistent with Canadian law and our international commitments. You, your organization, your products, or your intellectual property could become the target of would-be proliferators that could jeopardize, directly or indirectly, those relationships – and Canadian society. What does Canada do to counter the proliferation threat? The Government of Canada uses a range of tools and policies to address a multitude of proliferation threats. Canada’s Controlled Goods Program acts as the first layer of counter-proliferation; it regulates goods within Canada, including technical data that have military or national security significance. Canada then has export and border controls to ensure that goods leaving the country do so lawfully and are not sent to countries or entities which would misuse them, thus preventing them from becoming a threat to our national security and the security of our allies. The Human Pathogens and Toxins Act Licensing Program acts as another control over activities involving human pathogens and toxins. Law enforcement too plays an important role in countering proliferation through the investigation of proliferation-related criminal activity or when someone tries to get around these controls. Finally, Canada actively supports a number of international initiatives to improve global counter-proliferation cooperation and to build resilience to prevent the proliferation of WMD and the illicit acquisition of other items of proliferation concern. One of the Government’s most effective tools is raising Canadians’ knowledge and awareness of proliferation risks. Many departments and agencies across the Government already have established public outreach initiatives with stakeholders, including Canadian industry, the scientific community, and the broader public. Below are the questions that we are asking you to consider as you read this Discussion Paper. You may feel free to respond to any questions that are most relevant to you. Were you aware of these concerns about proliferation? If so, does this description match your understanding of the issue in Canada? If not, what would be the best way to communicate them to you in the future? Have you had any relevant experiences in your industry or field of research? How might the Government better communicate with the private sector about clandestine procurement activities in Canada? Do you see any linkages to Canada with what is happening around the world regarding the proliferation and use of WMD materials and other items of proliferation concern? Do you feel confident that you can spot proliferation red flags when dealing with potential clients? Do you know of any new items that are not covered by Canada’s current control programs that ought to be? Do you have any views or suggestions as to how the Government of Canada could or should address dual-use or sub-threshold items of proliferation concern not presently subject to control? Should the Government consider strengthening its controls on the intangible transfer of technology, and/or end-use/end-user verification? If so, do you have any views as to how best to accomplish that? Do you have any views on how Canada’s border controls could be improved? How can Canada ensure a robust electronic export reporting process and how could you contribute to the overall effectiveness of that process? Is there any proliferation conduct or service currently not prohibited in Canadian law that ought to be? If so, what is it? Do you feel that the maximum fines provided in Canada for proliferation-related offences are appropriate? If not, why do you feel that way, and what would you suggest would be appropriate? Do you feel that the maximum periods of imprisonment provided in Canada for proliferation offences are appropriate? If not, why do you feel that way and what would you suggest would be appropriate? Would your academic institution or industry benefit from closer interactions with the Government of Canada on preventing illicit proliferation of items of proliferation concern? What would be the best way to have further exchanges of views with you in the future about counter-proliferation? What other potential tools should the Government of Canada pursue to support its counter-proliferation efforts? Canada has long worked to prevent certain sensitive materials and technologies from illicitly leaving the country and falling into the wrong hands. Since 1947, when the Export and Import Permits Act was introduced, Canada has steadily built a domestic counter-proliferation regime and contributed to an international control regime that together work to restrict the import and export of goods and technology that may be detrimental to the security of the country and our allies. Today, more than 15 federal departments and agencies have roles and responsibilities related to counter-proliferation. However, proliferation is evolving in ways we have never seen before. People, goods, and money flow quickly and easily around the globe thanks to modern transportation, trade, financial networks, and the Internet. Technology is rapidly advancing in areas such as encryption and cryptocurrency, which can be used to hide illicit activities from authorities. As well, many goods and technologies – including everyday items – have the potential to be used or modified to produce weapons and military items. These are called “dual-use items of proliferation concern,” and their illicit acquisition and potential misuse is an important concern to the Government of Canada. Some states and non-state actors (e.g. terrorist organizations, insurgent groups, or organized crime syndicates, etc.) remain determined to acquire proliferation-sensitive goods and technologies for weapons-related purposes, and are skilled at using clandestine procurement networks and methods to circumvent even the most robust export control systems and international sanctions regimes. For example, by circumventing international controls and sanctions, North Korea has steadily advanced its nuclear and ballistic missile programs over the last decade, has recently used a chemical weapon agent in a targeted assassination, and continues to maintain chemical and biological weapons programs. Similarly, Iran has used complex procurement networks to advance its nuclear and ballistic missile programs. In some cases, companies with hostile intentions claim to act on behalf of a foreign state’s government, or are very closely linked to it. Foreign acquisitions of Canadian businesses are commonplace; our stable system of government, our open economy, and an educated workforce with high levels of disposable income are some of the reasons why Canada is an attractive place to do business. Moreover, promoting foreign direct investment in Canada is a hallmark of Canadian international trade policy. Nevertheless, differentiating between legitimate investment and that which is motivated by hostile intent can be extremely challenging. Canada’s counter-proliferation framework must be flexible, adaptable, and relevant in light of today’s reality. It should have the scope to address contemporary challenges, clearly identify the relevant authorities and policies to close gaps in the framework, and have a clearly established governance structure to coordinate activities among those with a vested interest in the issue. How best to respond to the proliferation threat while promoting Canada’s commercial interests and the facilitation of free trade is a complex issue. Furthermore, while Canada represents a small segment of the world’s population, it accounts for 2.5 percent of global merchandise exports. Trade and investment promote jobs and economic growth. The Government is striving to find an approach that protects national security while facilitating competitiveness in the global market and advancing our trade and economic prosperity. The question is: how do we remain an open society and commercially competitive while continuing to safeguard national security? The potential implications for Canadian prosperity are a constant consideration. This dialogue will help the Government develop more informed policies in this complex area. Counter-Proliferation: The efforts undertaken by the Government of Canada to detect, investigate, prevent, deter and disrupt activities and transactions in or through Canada involving the illicit acquisition, export or diversion of goods, technology or knowledge relevant to the development of chemical, biological, radiological and nuclear weapons (“weapons of mass destruction”, or WMD), their delivery systems, dual-use items of proliferation concern, and sensitive defence technologies, including space technology, which could constitute a threat to Canada and its allies. This includes the transfer of technology via intangible means (e.g. electronic, voice, etc.). Weapons of Mass Destruction: Commonly referred to as WMD, they are “a class of weaponry with the potential to, in a single moment, kill millions of civilians, harm the natural environment, and fundamentally alter the world and the lives of future generations through their catastrophic effects.”Footnote2 WMD include chemical, biological, radiological, and nuclear (CBRN) weapons and their delivery systems, such as ballistic missiles. Chemical Weapons: These weapons encompass any of the following: a toxic chemical or its precursors; a munition specifically designed to deliver a toxic chemical; or, any equipment specifically designed for use with toxic chemicals or munitions. Toxic chemical agents are gaseous, liquid, or solid chemical substances that use their toxic properties to cause death or severe harm. Chemical weapons include blister, nerve, choking, and blood agents, as well as non-lethal incapacitating agents and riot-control agents when used in warfare. Biological Weapons: Weapons that derive their primary destructive effects from living organisms or substances derived from them that intentionally cause disease or harm in humans, animals, or plants, or non-living material. Biological agents such as bacteria, viruses, parasites, fungi, prions, or toxins can be turned into weapons delivered as liquid droplets, aerosols, or dry powders. Radiological Weapons: Commonly known as “dirty bombs”, these weapons are intended to use conventional explosives or other means to spread radioactive material that may lead to short- and long-term health problems for an affected population and severely contaminated areas. Alternatively, a stationary radiological source can expose nearby individuals to radiation, without the use of explosives. Radiological weapons do not require nuclear weapon materials, only a substance with sufficient radioactivity to achieve its desired effect. Nuclear Weapons: While different types of nuclear weapons exist, all employ a nuclear fission or fusion reaction for their explosive power. Modern two-stage thermonuclear weapons derive their explosive energy from the combined power of nuclear fission and fusion (that is, an initial fission reaction generates high temperatures needed to trigger a secondary – and much more powerful – fusion reaction, hence the term “thermonuclear”). You are attending a conference for professionals in your field. While there, Person A – whom you have never met – approaches you and expresses interest in learning more about your latest products and research. This individual asks a lot of questions, but does not provide much detail on their own background. Their technical knowledge of the area seems superficial. This individual is nevertheless keen to keep discussing your work, and has expressed an interest in maintaining contact. Dual-Use Items of Proliferation Concern: Goods and technology that are capable of, or designed for use in, peaceful and legitimate civilian or commercial purposes, but which also have potential applicability in such activities as enhancing the capabilities of foreign adversaries, including their space capabilities, in relation to the development or enhancement of weapons programs, including WMD. This could encompass both those items already subject to control by Canada and key allies, as identified by the international export control and non-proliferation regimes in their respective dual-use lists, as well as goods and technologies that may fall below the threshold of existing export controls (“sub-threshold”). Some of the items that pose a proliferation concern are sub-threshold items from a Canadian and an international export control and non-proliferation regime perspective, but are, nevertheless, highly desired by procurement networks seeking to advance weapons programs. Some of these sub-threshold items are already addressed through Canada’s current WMD catch-all controls. Sensitive Defence Technology:Items with significant potential military applications that are not presently subject to controls and could give rise to national security concerns. These encompass both items specially designed for military use that are not subject to current controls, as well as a sub-set of the dual-use items of proliferation concern, for example, high-quality, high-tech components that may be useful for the development of advanced weapons systems. Space-related Items:Items that are asubset of both dual-use items of proliferation concern and sensitive defence items given their economic and military potential. For example, the items required to build civilian or military communications or imaging satellites are virtually identical, and would be included in this category. Canada is a recognized leader in many high technology sectors, such as nuclear energy, biotechnology/life-sciences, aerospace, chemicals, and electronics. Numerous items of strategic value are readily available here such as advanced computer technology and equipment, precision guidance, control and detonation equipment, radiation-hardened technology, specialty steels with nuclear, chemical and missile development applications, as well as raw materials such as uranium, to name a few. All of these factors help position Canadian companies to be among the most competitive in the world – Canadian merchandise exports reached $550 billion in 2017– and make Canada an attractive destination for foreign investment. Person A quickly follows up on their intention to stay in touch with you. This individual invites you out for a meeting over a lavish meal where they continue asking questions about your work. After some time, they say that they would be highly interested in arranging a business partnership with you very soon. They propose to purchase a certain quantity of your product or, potentially even more lucrative for you in the long run, a license to your intellectual property rights. Person A says that they would make the purchase on behalf of clients living in Country X that they represent. Person A knows that either option is going to be expensive, but they do not express any concerns about costs, explaining that their clients are wealthy investors. Sensitive or proprietary data, information, and expertise are of significant value to proliferators. Canada and other industrialised nations may be destinations of choice for individuals seeking advanced education or investments in specialized fields with potential applications in WMD programs or involving sensitive military technologies. Even instances of foreign students or investors attempting to acquire proliferation-sensitive items from universities or Canadian companies to transfer back to their home countries have been known to occur. In the cyber age, identifying and disrupting the illicit acquisition of information and knowledge is a significant challenge. Ultimately, it also means that you, your organization, your products, or your intellectual property could become the target of would-be proliferators. Like other Western countries, Canada is a potential target for clandestine procurement networks seeking high quality products for use in weapons development programs or sale to other potentially hostile actors. These networks, often using front companies, seek to illicitly procure technology, including those which are not subject to export controls. Some have tried to conceal small quantities of controlled technology within larger shipments of non-controlled items. Others falsify documents when the requirement for an export permit is unavoidable, or provide false reasons for end-uses and end-users. Some also ship sensitive materials and goods to intermediaries via complicated global shipping routes that often pass through countries with weak or non-existent control regimes. Still others could potentially attempt to use Canada as a base to illicitly acquire U.S.-origin controlled items for retransfer to third parties. Many states and non-state actors, including terrorist organizations, continue to actively seek the materials, means, and know-how to advance their WMD aspirations and to otherwise improve their military capabilities. In response, Canada, along with our allies and partners, is involved in a number of international initiatives and activities to build global resilience to prevent WMD proliferation and the acquisition of items of proliferation concern that could threaten our security. This includes enhancing the security of CBRN materials and the sites that house them around the globe through the G7, collectively reducing the threat posed by WMD terrorism, and building the capacity of at-risk states to carry out counter-proliferation activities through various initiatives such as the Proliferation Security Initiative. Canada also plays a leading role in, and provides extensive support and funding to, various international organizations that are addressing proliferation as part of their mandates; these include, for example, the International Atomic Energy Agency, the Organisation for the Prohibition of Chemical Weapons, and INTERPOL. Canada also supports the full implementation of United Nations Security Council Resolution (UNSCR) 1540, which calls for states to collectively build the capacity of at-risk countries which may require technical, legal, or operational assistance in carrying out counter-proliferation activities. Sanctions too are an important tool for Canada to address specific aspects of proliferation, and can include a variety of measures such as arms embargos and prohibition of technical assistance in specific sectors and financial transactions. Person A offers to pay you in cash to avoid taxes and for the sake of expediency to avoid the bank’s standard waiting period for large transactions to clear. Person A says they would like to avoid as much red tape as possible in this business partnership, and has suggested that they take care of the paperwork since they know the export system well. Person A asks that you help them by agreeing to fulfill their clients’ order in a series of small, standalone batches rather than one large order. Despite concerted international efforts aimed at restricting the spread of WMD, sensitive defence technologies, and items of proliferation concern, challenges remain. Many states lack the expertise or resources to take meaningful action. Some turn a blind eye to proliferation activities, or worse yet, actively assist in the pursuit of such weapons and their components. This problem is not theoretical. Some states and non-state actors have used WMD. As early as 2006, al-Qaida and other terrorist groups had carried out crude chemical attacks in Iraq using chlorine. Daesh in Syria and Iraq carried out attacks with chlorine and indigenously-produced crude sulfur mustard gas from 2014 up until its collapse late last year. Reports of Syrian regime attacks with chemical weapons have persisted throughout the Syrian conflict. Since the confirmed use of sarin nerve agent in Ghouta in 2013, the United Nations found that the Syrian regime under Bashar Al-Assad was responsible for several other chemical weapons attacks against its own people using both sarin and chlorine. Chemical and radiological weapons have been used in smaller quantities to carry out high-profile assassinations. In 2006, Russian defector Alexander Litvinenko was poisoned at a London hotel using the radioactive isotope Polonium-210. In February 2017, Malaysian authorities confirmed that Kim Jong-nam, the estranged brother of North Korean leader Kim Jong-un, was assassinated using the toxic liquid nerve agent VX. In March 2018, former Russian military intelligence officer Sergei Skripal and his daughter were deliberately poisoned in Salisbury, UK with what British authorities have concluded was an advanced Soviet-era “Novichok” nerve agent. In July, a British national in Amesbury died after inadvertent exposure to what is believed to be remnants of the same nerve agent. There are no Canadian links to these recent examples of chemical and radiological agent use. They do, however, demonstrate the erosion of respect for norms against the use of WMD. As Canada is a leader in a number of industries that deal with these types of substances – albeit for peaceful purposes – the possibility that a future attack could include a Canadian link cannot be discounted. In the scenario presented in this discussion paper, a number of red flags should have stood out. Did you catch them all? Unlike in the movies, in reality the threat often appears far more mundane and innocuous with proliferators usually hiding in plain sight. The Controlled Goods Program was established in 2001 to preserve the Canadian defence industry’s access to U.S.-origin “defense articles” (exported to Canada under the Canadian Exemptions of the U.S. International Traffic in Arms Regulations). The Controlled Goods Program safeguards and prevents the proliferation of controlled goods with a military and/or national security significance. The Program administers the Controlled Goods Regulations and the Controlled Goods List (i.e. militarily sensitive goods and technologies) found in the Defence Production Act. It is responsible for the registration and, as applicable, exemption of any person who intends to examine, possess or transfer controlled goods in Canada. The Program’s scope covers a wide array of activities, ranging from the security assessment, training and certification of key individuals, to compliance inspection and enforcement. Are consistent with existing sanctions’ provisions. Canada’s export controls, which are administered by the Minister of Foreign Affairs under the Export and Import Permits Act and the Canadian Nuclear Safety Commission under the Nuclear Safety Control Act along with their attendant regulations, are not intended to hamper legitimate trade but seek to balance the economic and commercial interests of Canadian business with the national interest of Canada. Canada participates in several international regimes that regularly review and publish updated lists of controlled items for export. Canada’s Export Control List (ECL) is updated annually to reflect changes agreed by the regimes. Separately, Canada’s sanctions are updated as required. The four export control arrangements – the Australia Group, the Nuclear Suppliers Group, the Wassenaar Arrangement, and the Missile Technology Control Regime – form the basis for the bulk of the goods and technology that are controlled for export and transfer by intangible means by the ECL. The lists of proliferation-significant items identified by the Nuclear Suppliers Group also form the basis of Nuclear Non-proliferation Import and Export Control Regulations pursuant to the Nuclear Safety and Control Act administered by the Canadian Nuclear Safety Commission. In addition to the ECL, Canada maintains a list of countries called the Area Control List (ACL), to which any Canadian exports – regardless of whether they are on the ECL or not – require a permit (see below figure). Applications for permits to export to any ACL country anything other than humanitarian goods or settler effects normally will be denied. Separately from export controls, Global Affairs Canada also implements sanctions pursuant to the United Nations Act, or on a national (autonomous) basis under the Special Economic Measures Act. Such sanctions are targeted at specific countries, organizations, or individuals. Sanctions are used to restrict or prohibit trade and other economic activity, as well as the possible seizure or freezing of assets and property on Canadian soil. Sanctions can vary and can encompass a variety of measures, including arms embargos and prohibitions on technical assistance (e.g. training) in specific sectors and financial transactions. For a complete breakdown of the permitting process, along with instructions for how to apply for an export permit, please consult the Export Controls Handbook. 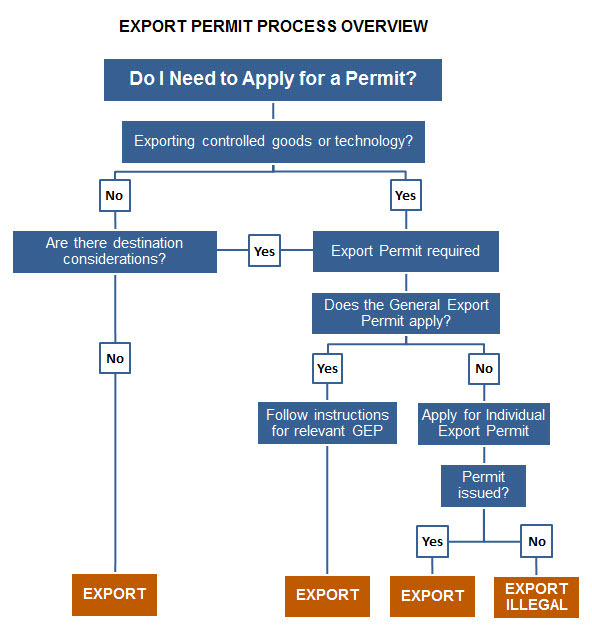 This flow chart provides an overview of the export permit process. The title asks, “Do I Need to Apply for a Permit?”, followed by the a box asking the exporter if they are exporting controlled goods or technology. If the exporter answers “No”, the flow chart asks if there are designation considerations; if there are none, then the exporter is free to export their goods or technology. If the exporter specifies that yes, they are exporting controlled goods or technology, or that yes, there are designation considerations, then the flow chart indicates that an export permit is required. If a General Export Permit applies to the good or technology, the exporter may follow instructions for obtaining the relevant General Export Permit, and then proceed to export; if no General Export Permit applies, then the exporter must apply for an Individual Export Permit. If the Individual Export Permit is issued, then the exporter may proceed to export; if said Permit is not issued, then export is illegal. Canada has a responsibility to ensure that goods entering the global market from this country do not pose a threat to our national security and the security of our allies. The Customs Act establishes reporting requirements for the export of goods from Canada and gives Canada Border Services Agency (CBSA) officersFootnote3 specific authorities to examine and detain goods for export, to ask questions about goods for export, and to take enforcement actions when non-compliance is identified. The three main objectives of export reporting are to: (i) control the export of restricted (i.e. regulated, controlled, or prohibited) goods; (ii) collect accurate information on Canadian exports; and, (iii) control the outbound movement of goods in transit through Canada. When goods for export are reported to the CBSA, a CBSA border services officer may examine and detain them. The CBSA may keep the goods under detention until they are satisfied that all requirements under the law have been met. While the CBSA works with various law enforcement and intelligence partners in Canada (and internationally) to identify illicit exports, the CBSA serves as the only federal agency in Canada that enforces export controls at the border. The CBSA interdicts and prevents unauthorized exports of sensitive goods and technologies thereby upholding Canada’s international commitments and serving as a deterrent to those looking to circumvent Canada’s counter proliferation regime. The CBSA enforces Canada’s regulatory export controls through various means, including warnings, monetary penalties and seizures. Assessing exports for compliance with Canada’s export controls can be a complex process. First, the CBSA will request that the exporter provide information to help the CBSA verify the sale of the goods, their technical characteristics, and their intended end use and end user. Second, the CBSA will consult with technical experts at other federal departments (e.g. Global Affairs Canada) to help determine if the goods are subject to an export permit or license requirement. When the CBSA has reasonable grounds to believe that an export control violation has occurred, enforcement actions may be taken under the Customs Act, ranging from monetary penalties to seizure of goods. Criminal investigations may also occur in relation to these export control violations resulting in charges under the Customs Act. shipping small quantities of controlled technology within larger orders or shipments of non-controlled items. The Human Pathogens and Toxins Act came into effect in 2015 to address health and safety concerns of an accidental or deliberate release of a human pathogen or toxin. Any stakeholder conducting controlled activities (possessing, handling, using, producing, storing, permitting access, transferring, importing, exporting, releasing, abandoning, disposing of a human pathogen or toxin) is required to apply for a license under the Act. Depending on the pathogen risk group or the security sensitive biological agent status for toxins, different licenses will be granted for a limited time period. All licensed facilities that intend to carry out scientific research on a regulated pathogen or toxin must also develop a plan regarding the administrative measures for managing dual-use concerns. The purpose of this plan is to warrant internal accountability on the identification, risk analysis, and mitigation of risks that come with the use of dual-use products that may be misused to pose a threat to public health and safety. Canada welcomes foreign investment because it plays an important part in our economy, bringing new technology and practices that can increase the productivity and competitiveness of Canadian firms. Recognizing the importance of investment flows into the country, Canada has a broad framework in place to promote trade and investment. The Investment Canada Act is one part of that framework. It provides for the review of significant acquisitions of control of Canadian businesses to ensure their likely net economic benefit. Separate from the net benefit review process, all foreign investments are subject to the multi-step national security review process set out in the Act. As articulated in the Guidelines on the National Security Review of Investments, the review process takes into account factors such as the potential effects of the investment on the transfer of sensitive technology or know-how outside of Canada, as well as any involvement in the research, manufacture or sale of goods/technology identified in Section 35 of the Defence Production Act. Investors are strongly advised, particularly in cases where the factors listed in the national security guidelines may be present, to contact the Investment Review Division at the earliest stages of the development of their investment projects to discuss their investment and, where applicable, to file a notification or an application for net benefit review at least 45 days prior to planned implementation. Law enforcement can investigate and bring charges for criminal offences related to proliferation, proliferation financing, and illicit procurement and trafficking. Both the CBSA and the Royal Canadian Mounted Police (RCMP) have mandates to conduct investigations, while the Public Prosecution Service of Canada has the mandate to conduct prosecutions. The CBSA is responsible for conducting criminal investigations related to violations of border legislation. When the CBSA suspects that an offence under the Customs Act, the Export and Import Permits Act, the Nuclear Safety and Control Act, and/or the Special Economic Measures Act has been committed in relation to an export or attempted export, the CBSA may initiate a criminal investigation. When goods are tendered for export, the CBSA will consider several red flag indicators that may suggest proliferation or an illicit attempt to procure sensitive goods. None of these alone necessarily indicate anything inappropriate, but taken together, they can paint a picture of a foreign entity, buyer, or end user who may be trying to circumvent export controls. Canadian exporters should be aware of these indicators and should conduct due diligence research to ensure that their clients are who they claim to be. Regulations that impose non-tariff (permit) controls on the international movement of commodities. Prohibits transferring a chemical weapon to anyone, or assisting anyone from developing them. Safeguarding Science is an outreach initiative that began in 2015, which aims to raise awareness within the scientific and academic communities of the risks of chemical, biological, radiological and nuclear proliferation, as well as the potential for proliferation of dual-use technology. The initiative brings together nine federal departments and agencies. Safeguarding Science partners visit interested institutions every year at no cost and deliver a workshop that promotes an open discussion regarding specific proliferation-related threats our Canadian scientific community is exposed to such as espionage, dual-use potential of research and cyber-attacks. Since 2016, Safeguarding Science partners have visited 17 academic institutions. Based on 248 participant’s responses, 98% would recommend the workshop. Safeguarding Science partners are planning to expand the initiative to reach a wider audience in the year ahead. Sometimes, one can break the law without knowing it. To address this risk, Canada undertakes a range of outreach to Canadian industry, the scientific community, and the broader public to provide information and raise awareness of the diverse risks related to the transfer or export of proliferation-sensitive goods, technology, and information. Work is ongoing to find additional ways to effectively reach all relevant sectors as well as the public to make them aware of the wide range of concerns, obligations and tools related to the prevention and disruption of proliferation. The Public Health Agency of Canada is responsible for regulating human pathogens and toxins in Canada. It engages regularly with a variety of stakeholders, including the biotechnology sector and academic research institutions to discuss biological safety and security and dual-use proliferation. Similarly, the Canadian Nuclear Safety Commission is in regular contact with Canada’s nuclear industry and laboratories, to maintain awareness of among other things, proliferation risks and responsibilities. Other government departments and agencies also conduct outreach with the private sector regarding export controls and associated proliferation concerns. For example, Global Affairs Canada, which administers the Export and Import Permits Act, performs outreach activities to industry, mainly focusing on individual companies and industry associations. Public Services and Procurement Canada provides support to companies to ensure compliance with the Controlled Goods Program’s requirements. Canada also undertakes outreach activities to raise awareness of the financial and investment components. Under the Proceeds of Crime (Money Laundering) and Terrorist Financing Act reporting entities have an obligation to implement effective compliance programs, which includes the requirement to regularly conduct risk assessments and have a robust capacity to identify suspicious transactions. Reporting entities must report suspicious transactions reports to the Financial Transactions and Reports Analysis Centre of Canada (FINTRAC) if they have reasonable grounds to suspect that the transaction is related to the commission or attempted commission of a money laundering or terrorist activity financing offence. FINTRAC uses this transaction data, as well as other appropriate information, to produce financial intelligence for law enforcement and security agencies investigating money laundering, terrorist financing, and threats to the security of Canada which may include proliferation by state or non-state actors. Also, in the context of administering the Investment Canada Act, Innovation, Science, and Economic Development Canada is working with other federal partners to develop an outreach strategy to industry that will raise awareness of general threat trends and the Guidelines on the National Security Review of Investments. Canada is a recognized leader in many scientific and high-technology sectors and is home to the some of the world’s latest groundbreaking research in multiple fields. We also have a strong tradition as an open, welcoming society and a trading nation. Everyone has a role to play in helping to keep Canada safe and secure. Safeguarding Canada’s national security and promoting Canadian economic prosperity are complementary goals, and we are seeking to strengthen our counter-proliferation framework in a balanced way that supports both. The issues described in this Discussion Paper relate to major components of our counter-proliferation framework. We hope that the information presented here helps Canadians understand this complex area as we undertake consultations about how Canada can better respond. Your views will help inform the Government as it designs the most effective mechanisms to deal with the evolving proliferation threat facing Canada and the world. Thank you for taking the time to read this Discussion Paper. Your feedback is important to us, and we look forward to hearing your views. You can submit your comments using the following email address: ps.nspdcptf-dpsncpfat.sp@canada.ca. The CBSA is responsible for ensuring that goods exported from Canada meet all requirements under the law. In support of this mandate, CBSA officers risk assess export declarations, examine goods, and detain export shipments to ensure that they are compliant with export controls. The CBSA works in partnership with local and international law enforcement partners, government agencies, industry and the community to identify, disrupt, prevent and investigate the unauthorized / illicit export of strategic goods and technology. The CBSA also assists Immigration Refugees and Citizenship Canada with the security screening of foreign nationals seeking to enter Canada. CNSC is responsible for issuing licenses for nuclear-related activities including the import and export of nuclear and nuclear-related dual-use goods. CNSC also employs its end-use (catch-all) control with regard to unlisted items destined for programs of concern. CNSC is active in Canada’s counter-proliferation community in terms of assessing goods for their export control status, issuing or denying licenses for the export of relevant items, and serving as technical experts on issues related to nuclear and nuclear-related dual-use goods. CSIS is mandated to investigate threats to the security of Canada and advise the Government, and as such, is the main intelligence collection and analysis organization for counter-proliferation in Canada. CSIS informs and provides assistance to other government departments and agencies on counter-proliferation threat-related activities with a Canadian nexus. In addition, CSIS liaises with foreign partners on counter-proliferation issues and collaborates with other partners in Canada’s counter-proliferation community. CSIS also plays an important role in preventing non-Canadians engaged in proliferation activities from entering or receiving status in Canada through its provision of advice to CBSA and IRCC in support of admissibility decisions. CSE provides foreign signals intelligence to the Government in accordance with Government of Canada intelligence priorities. Finance Canada supports the Minister of Finance’s overall responsibility for Canada’s anti-money laundering and anti-terrorist financing (AML/ATF) regime, legislation (the Proceeds of Crime (Money Laundering) and Terrorist Financing Act (PCMLTFA)) and associated regulations, as well as oversight of Canada’s financial intelligence unit and compliance regulator for the PCMLTFA, the Financial Transactions and Reports Analysis Centre (FINTRAC). The Minister of Finance is responsible for financial sector policy and legislation, including safeguarding Canada’s financial system from illegitimate use. Finance Canada also leads the Canadian delegation to the Financial Action Task Force, the international standard setter for combating money laundering and the financing of terrorism and proliferation of WMD. DOJ supports the Minister of Justice both in terms of the ongoing operations of government as well as the development of new policies, programs and services for Canadians to support the Government’s priorities. It also provides legal advice to the Government and all federal government departments and agencies, represents the Crown in civil litigation and before administrative tribunals, drafts legislation, and responds to the other legal needs of federal departments and agencies that comprise Canada’s counter-proliferation community. DND/CAF provides a range of capabilities to address WMD threats such as intelligence, CBRN Response Team elements, and logistical support. Through capacity-building efforts aimed at supporting key partners’ abilities to anticipate and deal with WMD threats and incidents, the CAF contribute to reducing the risks posed by proliferation. DND also plays a key role in Canada’s counter-proliferation efforts by conducting research and development on defensive capabilities, assessing risks and threats of emerging technologies, evaluating the security implications of proposed exports in support of national export control authorities, and helping monitor compliance with international non-proliferation regimes. In addition, DND leads Canada’s operational participation in the Proliferation Security Initiative. FINTRAC contributes to the prevention and deterrence of money laundering and terrorist financing by ensuring compliance with the Proceeds of Crime (Money Laundering) and Terrorist Financing Act (PCMLTFA). Millions of transaction reports are sent to FINTRAC each year by banks, credit unions and other financial intermediaries, resulting in financial intelligence that assists in the investigation and prosecution of money laundering, terrorist activity financing and other threats to the security of Canada. These measures strengthen Canada’s financial system by deterring individuals from using it to carry out terrorist financing and other criminal activities. GAC manages Canada's foreign policy, promotes the country's international trade and development priorities, and leads Canada’s international humanitarian assistance program. The Export Controls Operations Division of Global Affairs Canada is responsible for the administration of export and import controls for strategic and military goods and technology under the authority of the Export and Import Permits Act. The Non-Proliferation and Disarmament Division is responsible for the implementation of the Remote Sensing Space Systems Act, including licensing of remote sensing systems and related regulatory activities, and is the Canadian National Authority for the Chemical Weapons Convention Implementation Act which includes the licensing of certain chemicals controlled thereunder. The Division also has the lead policy responsibility for the Nuclear Suppliers Group, Australia Group and Missile Technology Control Regime, and for Canada’s bilateral nuclear cooperation agreements. GAC is also responsible for the implementation of sanctions pursuant to the United Nations Act and the Special Economic Measures Act. IRCC facilitates the arrival of immigrants, provides protection to refugees, and offers programming to help newcomers settle in Canada. In collaboration with domestic and international partners, IRCC conducts screening of visitors as well as permanent and temporary resident applicants to protect the health, safety and security of Canadians, including from proliferation-related risks. Counter-proliferation referrals can originate at any point across the IRCC’s vast network of points of service, both in Canada or abroad. ISED administers the Investment Canada Act, which provides for the review of significant investments for their likely net economic benefit to Canada, and for the review of all foreign investments for their potential to injure national security. PHAC is the national authority on biosafety and biosecurity for human pathogens and toxins. The PHAC is responsible for the regulation of human pathogens and toxins under the authority of the Human Pathogens and Toxins Act and the Human Pathogens and Toxins Regulations and the importation or transfer of pure cultures of terrestrial animal pathogens and toxins, with the exception of non-indigenous animal pathogens and pathogens causing emerging animal disease, under the authority of the Health of Animals Act and the Health of Animals Regulations. PS plays a lead role in coordinating the policy work of the federal counter-proliferation community in order to identify and address gaps in Canada’s counter-proliferation regime. The Department also works closely with three Public Safety portfolio agencies: the CBSA, CSIS and the RCMP. Through the Contract Security Program (CSP), PSPC provides contract and personnel security screening services for contractors before they are entrusted with Protected and Classified information and assets, which they require in order to participate in Government of Canada and foreign government contracts. Through bilateral international security instruments, PSPC also ensures classified information is not provided to untrusted foreign governments and industries. PSPC also administers the Controlled Goods Program (CGP), which regulates the domestic examination, possession and transfer of controlled goods through standardized security assessments of individuals and company personnel (including ownership). The activities of the CSP and CGP help to prevent the proliferation of sensitive technologies, including military equipment, missile technology and related intellectual property. The RCMP’s Federal Policing Program investigates criminal activities associated with proliferation, in accordance with its mandate to investigate threats to the security of Canada. The RCMP’s efforts to counter proliferation and proliferation financing are focused on four types of activities: outreach, training, intelligence, and enforcement. The RCMP works in partnership with local and international law enforcement partners, government agencies, industry and the community to disrupt and prevent the illicit traffic, diversion and proliferation of strategic goods and technology. For more information on Bill C-59, An Act Respecting National Security Matters, visit www.parl.ca/LegisInfo. Or any other officer as defined in the Customs Act, which includes “a person employed in the administration or enforcement of this Act, the Customs Tariff or the Special Import Measures Act and includes any member of the Royal Canadian Mounted Police”.